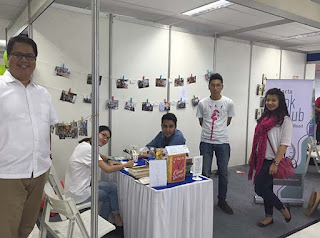 Jakarta Book Club was invited by Mizan Publishing to occupy a half of their space at the Indonesia Readers Festival (Festival Pembaca Indonesia), from Dec 5-6, 2015. PW contacted me and said, "Create some activities, Shir, like games or something." He gave us a signed copy of "The Casual Vacancy" by the Brit author J.K. Rowling. That book is worth around Rp 175,000 if you buy the Indonesian hardcover version. But, with a real signature.... it becomes priceless, isn't it? (Unless you decide to put it on auction someday when Rowling is no longer alive). In overall, the book is a good investment for book lovers. We arrived around 9:30am on Saturday and found the space was rather small compared to a convention hall like Balai Kartini which held the event last year. 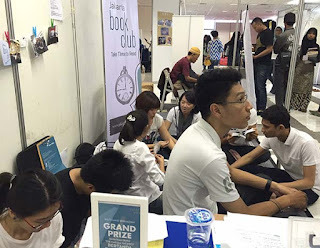 This is my first year attending International Readers Festival (Festival Pembaca Buku), so I have no idea that the event is mainly gathering communities of book lovers among themselves --even though they end up mingling with their own groups. 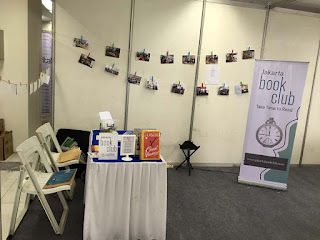 The organizer did not allow booths to sell books. I looked around the room and realized that there was no Books and Beyond, Periplus, or Aksara book store. I also found that English-language reading is also almost non-existence and there were no foreigner visitors. 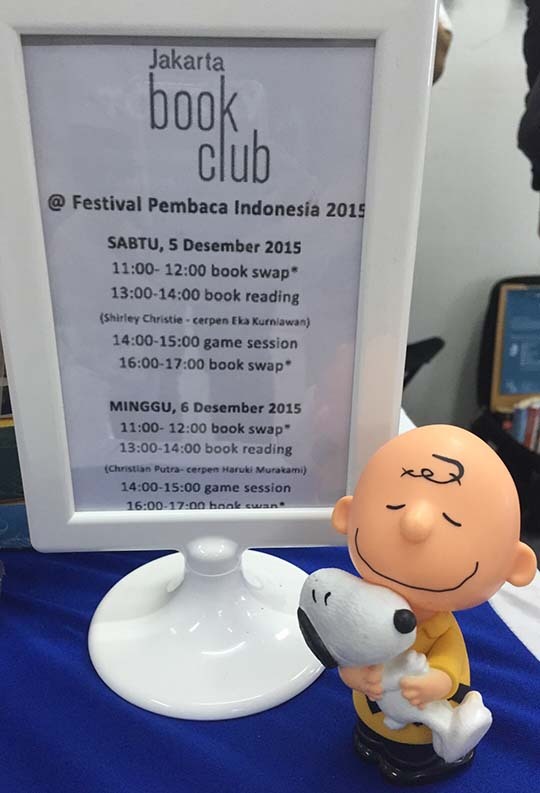 This event is really a book festival for Indonesians. It made us feel a bit out of place. In our book swap and book reading activities, we discussed English books more than Indonesian books. This is probably not a good or bad thing, it is just the reality. In the end, like a publisher friend says, a book club -- big or small -- is a place where everybody can share about their favorite books. 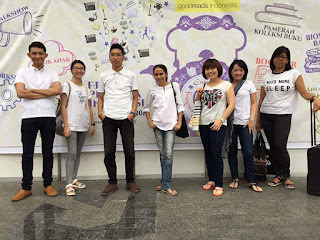 The people who hang out with Jakarta Book Club is our own reflection of circles. No matter how hard we try, those who feel being left out or "unique" are slowly running away from the pack. For example, even if we speak mixed language between English and Indonesian, we would not attract foreigners because they might be confused of all the jargons and Jakartan slang that we often slip into our conversations. Nevertheless, the show must go on! Four days prior to the event, I have met seven volunteers who are willing to help out and divided them into four shifts. 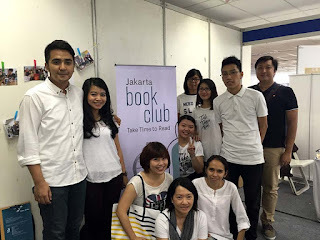 I am so grateful for them; most of which are new members who want to get to know Jakarta Book Club better in a short period of time. 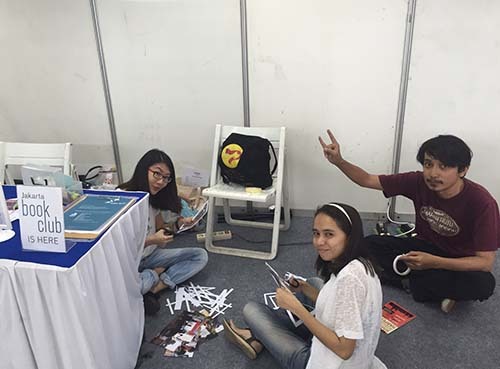 On Saturday, Dina, and I came to set up the booth, banner, book corner, decoration, etc. S and Y came to help out with such eagerness that made my heart melt. Being a part of a community means you are giving away your time, energy --and sometimes money, too -- because we are absolutely not paid to do this; staying around the booth from 9am to 5pm, creating activities, talking to visitors, etc. Thank you, JBC volunteers! I think Jakarta Book Club is lucky to have 3 women as the officers a.k.a. mediators in charge. Research shows that women are more balanced and detailed-oriented when it comes to preparing plans and coordinating them. We are also lucky to have a balanced proportion between female and male members. The last gender tends to dominate in the meetup -- and that is how we got to discussed "erotica" in November -- and attract similar minds into the group. "That's quite unique," my friend Fahri said. "Usually a book club is dominated by females," he explained. Am I surprised? Not really. In a lot of ways, I think like a man. Aulia, who collaborated with me in this community, also thinks like a man. She is very independent, practical, and sharp. Thank God for Dina, who had put more feminism and beauty into the group with her excellent artistic skill! On the first day, we had 2 book swaps, book reading, and a game session. Book reading is something that I think we can do as a group, in a greater scale, in the future. Why do I think this is important? Well, the Bible did say that "faith comes from hearing", which could also mean that someone could believe something more easily after he or she hear about it. I want more Indonesian read more books, believe that reading is just as fun as browsing Facebook -- or even more fun -- because they can learn a lot about the world and themselves from books. After lunch time, I read 2 stories from one of Eka Kurniawan's books titled "Perempuan Patah Hati...". As I told the audience, this book is interesting for me because it shows how he has developed himself as a writer in over a decade. His stories are not all readable, fluid or "unconventional". Some are just ordinary, even silly... but again, we all need to "bloom" at the right time. Although the ambiance was quite distracting, I managed to scream my lungs out and finish the readings within half an hour. The audience said they enjoyed "Cerita Batu" more than the featured story "Perempuan Patah Hati...". I am glad they did. So, the next time they go into a bookstore, they would remember Eka Kurniawan and buy his books. Before they realize it, they have bought more and more books, and become an avid reader. No country would mind having more scholars and thinkers as their citizens --except DPRK, perhaps. 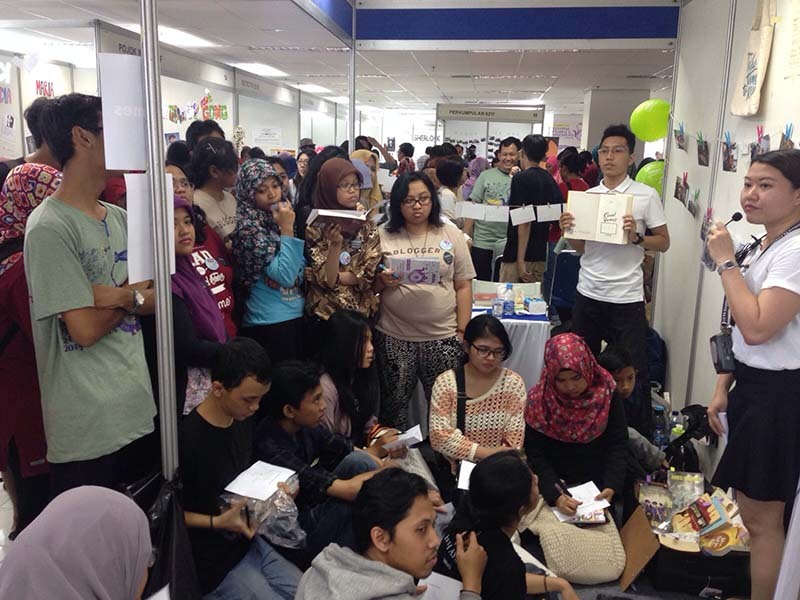 The game session on Day 1 had around 12 participants, mostly aged 17-22. We learned a lot from the first day, and prepared a lot of things for Sunday. From the printouts, the game, to water kettle -- a simple thing that could make coffee or tea to make our brains function better. The one thing that we did not like about the event (or the building, Synthesis Square) was the fact that they did not sell enough food and drinks, or located nearby a mini-market. The publishing company who invited us also did not inform us on this. So, I called Go-Jek to deliver pizza on the first day, and brought some snacks for everybody. C brought some snacks and drinks on the second day. Several people said we need to find monetary sponsorship, and I agree now. I shouldn't keep on using my money (or ask money from officers) to run the group activities. The book reading session on Day 2 attracted more crowd -- our active member CP had a brilliant idea to play some music on at our booth, especially during the book reading. 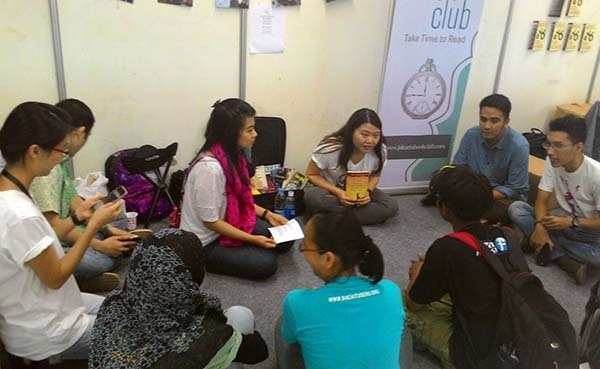 We had young people aged 15-19 came in and sat down quietly to hear Haruki Murakami's story. CP read a story from "After the Quake", but all I could hear was some words about Japan and a frog. We did not expect that the voice from the main stage was super loud. OK, maybe we should have borrowed a portable microphone by then. Next time, we should make a quiz to test if people are really listening to the stories that we read. Lol. Right after the book club, we wanted to move on to the game session. Once people heard that the prize was a signed copy of J.K. Rowling's book ("The Casual Vacancy"), we saw more people coming in -- including one or two people from Blogger Buku Indonesia (BBI). It is a bit unfair, I think, since these guys are basically reading and reviewing book for a living, right? If we knew they were coming, we would have made the questions harder. But, anyways, the prize had been given away, and our job is done! If you are curious about your level of "nerdiness" when it comes to books, join Jakarta Book Club crossword puzzle games. 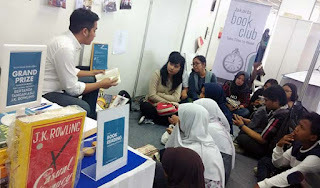 All in all, it was a fun weekend with IRF, although the quality level of attendance is a bit different that what we would expect from Goodreads Indonesia. We hope it would be better next year. Thanks to our awesome volunteers and members who have come and manned the booth, we have about 100 people signed the guest book. But then, we would still need to see the amplifying effect of it within the next few weeks. Let's aim for greater things!